PARTICIPATED IN THE CHATTANOOGA CAMPAIGN, NOVEMBER 1863. ASSAULT AND CAPTURE OF LOOKOUT MOUNTAIN, NOVEMBER 24TH, 1863. 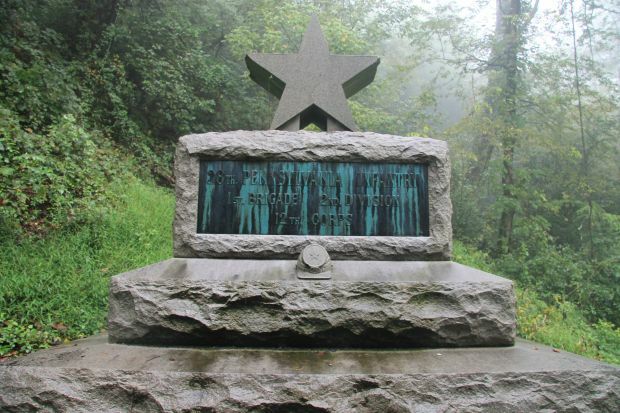 ASSAULT AND CAPTURE OF MISSIONARY RIDGE (ROSSVILLE GAP) NOVEMBER 25TH, 1863. ENGAGEMENT AT PEA VINE CREEK, NOVEMBER 26TH, 1863. ASSAULT AND CAPTURE OF (TAYLOR'S RIDGE) RINGGOLD, NOVEMBER 27TH, 1863. LOSSES IN THE CAMPAIGN: KILLED AND DIED OF WOUNDES 13, WOUNDED 21, TOTAL 34.